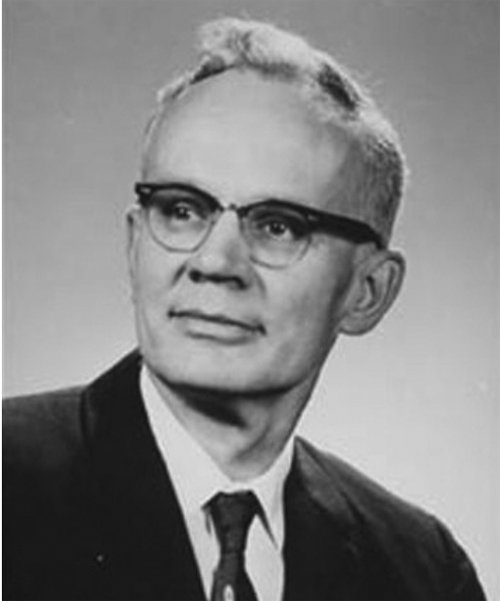 Professor Andrew F. Sobczyk (1915–1981) was born and raised in Duluth, Minnesota. His high school principal said that Andy was the best graduate he had encountered. Andy earned BA and MA degrees from the University of Minnesota. He then entered the doctoral program at Princeton University and received his Ph.D. degree in 1939. Part of his thesis proved that the Hahn-Banach Theorem was valid in complex valued Banach spaces. He and his advisor H.F. Bohnenblust published a version “Extension of complex linear functionals” in the Bulletin of the American Mathematical Society in 1938. The remaining part of his thesis is contained in his next paper “Projections in Minkowski and Banach Spaces” was published in the Duke Journal in 1941 (volume 8, pp 78-106). This was followed by a number of papers emphasizing the geometrical aspects of functional analysis. He taught at the University of Oregon from 1939–1942. During the war he did work in control theory and servomechanisms for the Radiation Laboratories (M.I.T.) and at Los Alamos. After the war he continued his work at Boston University, the University of Florida, Miami University and the University of Southern Illinois. Clemson University was quite interested in establishing expertise in the area of functional analysis and two members of the faculty (Bill Hare and John Kenelly) had been students at the University of Florida while Andy was on that faculty. To entice him to join the Clemson faculty funds were raised to establish a chair and Professor Sobczyk was hired as the Samual Manor Martin Professor of Mathematics at Clemson University in 1965. At that time he was 50 years old. The graduate program at Clemson was young and his presence on the faculty enabled the Department of Mathematics to offer the Ph.D. degree. (A requirement was that someone of national statue with experience in directing Ph.D. degree students be a member of the faculty.) One of the early contributions that Andy Sobczyk made to establish the graduate program at Clemson University was to organize a 1967 three-day conference “Projections and Related Topics” which featured many world renown participants in the field of functional analysis (see QA501.C6 in the Clemson University Library for proceedings of this conference). During the six-year period 1964 to 1970, the Mathematics Department hired over twenty Ph.D. mathematicians. This activity involved visits from many mathematicians and Andy was responsible for more than his share of phone contacts, arranging the visits and entertaining those mathematicians and others scientists who recommended candidates or were unsuccessful candidates for those positions. In addition there were visitors who came to collaborate with Andy on research. He published 22 papers and directed 6 Ph.D. students in the period 1965-1974. Beginning in about 1975 the Department began to offer more breadth in the program. The areas of statistics, computational mathematics, and operations research were developed and the number of advanced courses in functional analysis was somewhat limited. At this time Andy turned his research more into the area of combinatorics and later into mathematical physics. Research in these areas (especially mathematical physics) were required more background and the number of students attracted to Professor Sobczyk’s research fell off. He only produced one more doctoral student in the last years of his professional life but he continued to produce research. (He had a total of 50 refereed publications.) In the meanwhile he traveled to Poland (the ancestral home of his family) and into Russia. He learned to read and speak Russian quite late in life and seemed to enjoy this activity. Other life-long interests were in ham radio set and classical music. Andy Sobczyk was widely known in the mathematical world. He was a regular participant at meetings of the American Mathematical Society and the Mathematical Association of America (delivering the Southeastern Section Lecture in 1969). He was a personable man with keen curiosity and a generous nature. He died on November 7, 1981, a victim of cancer. His wife Aurelia lives in Clemson. His five children are located in Georgia, Mexico, South Carolina, and Idaho. His son Garrett teaches mathematics in Mexico. The Sobczyk family and friends established a fund in honor of Professor Sobczyk. The income from this fund is used to offer an annual lecture (with few exceptions) in the areas of mathematics and mathematical physics that Andy worked. The first lecture (1982) was a summary of his work and life given by his colleagues, friends, and family. This biography was contributed by Jake Wyrzykowski, a relative of the subject, in 2015.